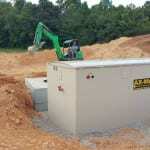 Call us today to learn how our septic services in Tampa, FL can benefit you. If you have a septic system, it is most likely one of two main types: gravity-fed or alternative. An alternative system has a pump, which helps move liquid and solid waste and water through the pipes, out of the home or office building and into the tank. Various items that we use in our homes and offices can clog the pipes, so if you do have a septic system, use caution when flushing items down the drains. If your pump is not able to clear a clog, we can bring out a pump truck to use stronger force to move the clog and relieve pressure on the pipes. If a clog is left untreated, it will cause water and waste to back up and possibly come into your home or office. Watch for potential signs of clogs, such as slow-draining sinks or showers, higher water levels in the toilet, or even water coming up through floor drains. If you do have a problem with a pump in your septic system, we can help with pump repair or replacement. This is just one of the many septic services that we offer to those in the Tampa area, and our experienced technicians can remove clogs safely and effectively. At Southern Water & Soil, we offer septic services to residential and commercial properties in Tampa, Florida, as well as surrounding cities, including Zephyrhills, Lutz, Dade City, Brandon, Plant City, Odessa, and Land O Lakes. Call us today to learn how our septic services can benefit you.